Nokia looking to upgrade the N97 already? Nokia might be one of the biggest producers of mobile phones, but it's also one of the best at mocking up fantasy handsets too. 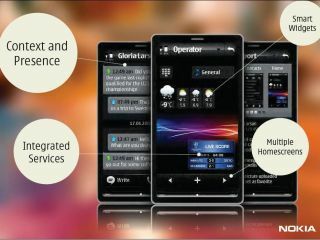 The latest comes from a leaked slide of a recent Nokia presentation from the Capital Markets Day 2008, which showed a handset sporting a UI that seems much more in keeping with the 'futuristic' touchscreen handsets we've all dreamed of. The S60 interface that Nokia has tweaked for the touchscreen has drawn criticism from some quarters, so moving to this design would obviously be a design win for the company still trying to find THE device that's more popular than the iPhone. The concept handset has multiple homescreens accessible via the arrow keys, with a much larger screen and thinner bezel, and combines some of the decent features from the likes of the 5800 and N97, including the updating friends homescreen. It's unlikely we'll see this handset in action, but something based along the same lines could well be in the pipeline, as Nokia's concept labs often bear fruit, although in not quite as an exciting manner as the original designs suggest.